Just a note this is an article that I had published in the Feb 1, 2011 Kings County Record. The Sussex Corner Winter Carnival is this weekend and I hope to see you there. Celebrations and festivals are great ways to bring people together in a community and allow them to enjoy the best their region has to offer. Over the last few years the Village of Sussex Corner has revitalized their annual winter carnival to a point where the community now anticipates its arrival. I am proud to be a part of this effort and I too look forward to its annual arrival which I am happy to say is February 11th and 12th. The Sussex area is blessed with many such celebrations and there isn't a season that goes by without a reason to celebrate. The festivities vary in size and activity but all of them provide the community with a reason to get out and socialize. The Sussex Corner Winter Carnival is no different and it is a great way to break out of those winter time blues and enjoy what winter has to offer. No matter what your interest is there is likely something for you to enjoy there. As a Canadian you likely enjoy hockey so you might want to register a team for the Corner Cup pond hockey tournament or maybe compete in an "Amazing Race." 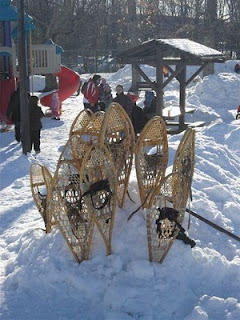 Maybe you like something slightly less competitive so you might be more into the snowshoe or cross country ski outings. If your family isn't up for those you can simply enjoy the free skating and games that will be offered throughout the day on Saturday. The kids will love Peter and Penny Penguin and get giddy with excitement while competing against them in the kid's games. If you are into art and entertainment the Winter Carnival has you covered as well. There will be snow sculpting contests, music, and magicians there to entertain you between all the other events. Horse drawn sleigh rides cater to those looking to enjoy the old fashioned style winter fun and of course you can't have a winter carnival without having a sliding hill. Likely the best thing the Sussex Corner Winter Carnival has going for it is that all these wonderful activities all take place in one location. Unlike some similar festivals where you have to commute from activity to activity, the Sussex Corner Winter Carnival is situated so that you can park your car and take it all in with only a short walk, snowshoe, or cross country ski to the next activity. By the end of the fireworks on Saturday evening you'll be asking yourself "Why don't we do this more often?" You'll have talked to friends and neighbours and caught up on all the good things going on in their life and shared your latest news. After the fireworks the community will be closer and if we happen to start to drift apart again, the next festival will draw us all closer again. We really are lucky to live in such a close community where people step forward and organize events like the Sussex Corner Winter Carnival. If you are looking for other events the Dairytown Classic basketball tournament, the Apohaqui Winter Fun Day, the annual Snowball tournament, plus many other events are waiting for you to wander through and all are coming up soon. I hope to see you in the snow banks.